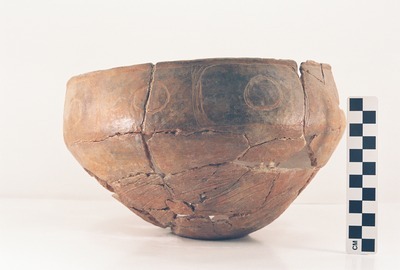 "41AN1-5, Burial E-1" by Timothy K. Perttula and Robert Z. Selden Jr.
DECORATION: The vessel is engraved on the rim with five negative circles. There are smaller engraved circles at the center of the negative circles, which are defined by four closely-spaced vertical engraved arcs. Five small engraved circles divide each of the negative circles. Portions of the vessel body have diagonal brushing marks. Poynor Engraved, var. Lang carinated bowl (Vessel 41AN1-5).